Logo Mats are a nitrile rubber backed, nylon topped mat for low to medium traffic entrances, indoor or outdoor. 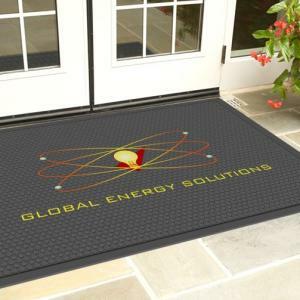 Logo Mat – Inkjet plus mats are a great way to get your message across to everyone who walks through your door! Consisting of a hard wearing nylon surface backed with nitrile rubber, this product is machine washable so it can always look fresh and bright. With the capacity to print 16 colours from a pallet of 40 standard colours, it is easy to replicate your logo or any other image to suit your requirements. PMS colours are also available. The durable nylon plush pile surface effectively wipes and dries footwear whilst also being ultra-absorbent. The nitrile rubber backing means the mat will sit flat on the floor and will not crack or curl. Ideal for medium to high traffic entrances, indoor or covered outdoor, this product is available in six popular standard sizes and can also be custom made to your requirements.